Nanoscale Semiconductor Lasers focuses on specific issues relating to laser nanomaterials and their use in laser technology. 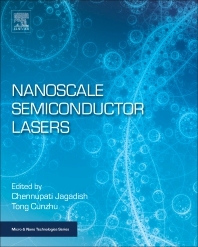 The book presents both fundamental theory and a thorough overview of the diverse range of applications that have been developed using laser technology based on novel nanostructures and nanomaterials. Technologies covered include nanocavity lasers, carbon dot lasers, 2D material lasers, plasmonic lasers, spasers, quantum dot lasers, quantum dash and nanowire lasers. Each chapter outlines the fundamentals of the topic and examines material and optical properties set alongside device properties, challenges, issues and trends. Dealing with a scope of materials from organic to carbon nanostructures and nanowires to semiconductor quantum dots, this book will be of interest to graduate students, researchers and scientific professionals in a wide range of fields relating to laser development and semiconductor technologies. is Professor of Hundred Talents Program at Changchun Institute of Fine Mechanics and Physics (CIOMP), Chinese Academy of Sciences, China. He is also Deputy Director of State Key Laboratory of Luminescence and Applications. His primary research is developing a high-performance laser system for industrial and military applications; other interests include quantum dot nanocavity lasers, high power high brightness lasers, and beam combination of diode lasers.